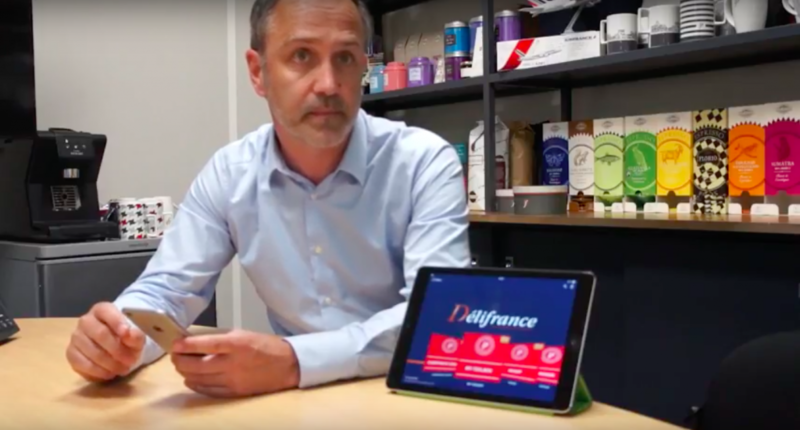 Fabrice Herlax, Chief Marketing & Operations Officer at Délifrance, equipped his company’s sales department with a mobile sales presentation application to assist the department in their work. When searching for new franchisees in different countries, Fabrice Herlax looked for a tool that could easily integrate a certain number of presentation documents. One of his requirements was that the solution should be simple, and available without an Internet connection. Providing his salespeople with a mobile sales-support application seemed to be the best option for what Délifrance was looking for. The bakery company’s CMOO was seduced by this turnkey solution: an easy-to-use application, managed through an administration interface that allowed instant adjustments to the application’s content. How was the sales-support application rolled out at the company? How have your employees taken to the application? In Délifrance, two units have received the client-meeting application. One is the team responsible for business development and customer leads, the other is the sales department whose role is to open new stores. The two units have happily embraced the new tool and use it daily. Given this success, the company has opened up access to certain presentations in the application’s infrastructure for master franchisees so that they can have the latest information when they themselves are in a type of sales presentation. In essence, Délifrance has harmonized its sales pitch. What have you noticed since using Touch & Sell? Before using the tablet application, sales would go to meetings with papers in hand or a computer that wasn’t practical to lug around. As for the client’s experience, you can guess… According to the Chief Marketing & Operations Officer, Touch & Sell has by all accounts facilitated the interaction between the salesperson and the client during the presentation. With all documents at hand and being able to slip easily from a PDF document to a video, the company gives off a modern, professional image. Fabrice Herlax has compared the Touch & Sell solution to a 4×4, the application is “suited to all terrains”. How would you describe your relation with Touch & Sell? Délifrance’s interest in the Touch & Sell solution has now moved onto the smartphone. Fabrice Herlax espoused: “we quickly identified the smartphone as a complement to the tablet.” He recommends this use for one-off, unscheduled sales meetings such as at trade fairs, “the need to have identical access through a smartphone seemed obvious to us.” The Chief Marketing Officer personally uses the Touch & Sell application only on his smartphone. It allows him to have constant access to all content to bolster his sales presentation when on business trips.